I attended a worthwhile webinar session from QSR on using NVivo to conduct Content Analysis research. These free webinars are offered at regular intervals and can be accessed online. I learned some new tricks and best practices for organizing projects, conducting coding and analysis, and querying a corpus of data to gain insights. When it comes to investigating an issue, answering a question or simply making sense of something, we often look to information to help us get there, and it’s rare that numeric or linear data will give you the full picture on its own. Qualitative or unstructured data can hold the key to richer insights and true research discovery that can revolutionize your recommendations. Let’s face it, it is easy to get lost in a lot of content-based data. After all, there’s a proliferation of unstructured data being created today. And manually going through the haystack to find the needle is an insurmountable, unrealistic task to complete. But that’s where NVivo comes in. NVivo is qualitative data analysis software that provides structure to content, helping you quickly unlock insights in your data. So come see how NVivo can help you organize, analyze and find insights in your unstructured or qualitative data. 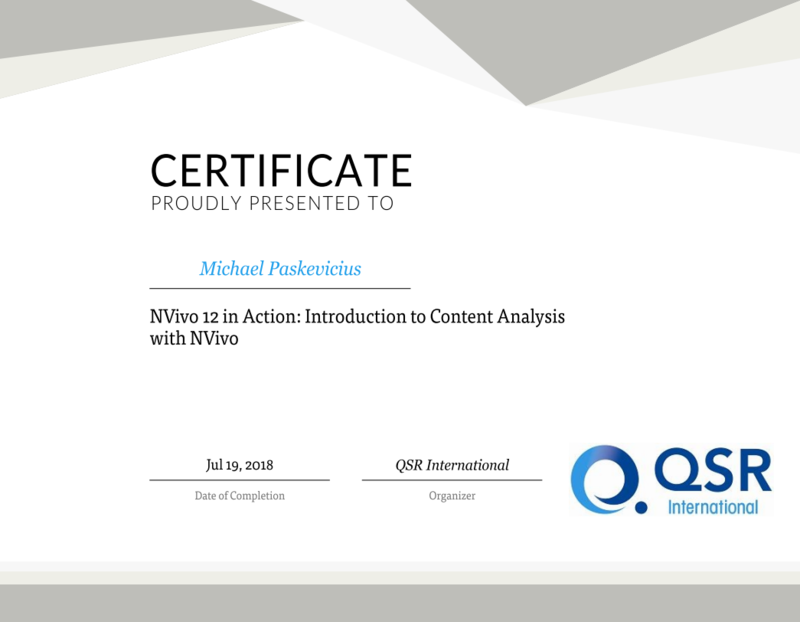 NVivo 12 in Action: Introduction to Content Analysis with NVivo by Michael Paskevicius is licensed under a Creative Commons Attribution 4.0 International License.